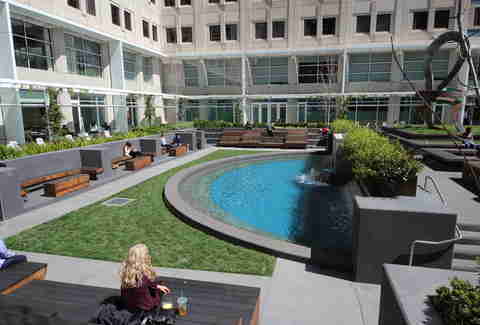 Due to some awesome law, all of the large, privately owned buildings in Downtown SF need to provide a certain amount of space on their property that's open to the public. Most of them are just concrete courtyards or pedestrian walkways with benches, but a small handful are actually pretty awesome. Like, 15th-floor-rooftop-terrace awesome. We checked out all 50+ POPOS (Publicly Open Privately Owned Spaces), and narrowed it down to five that're actually worth checking out (four of which are obvi on rooftops). Oh, and we've got a guide for how to find each, because weirdly, the privately owned buildings aren't super into publicizing directions. These are San Francisco's unsung heroes. All 12 of them. How to get here: Take the escalators to the third floor, turn left, and look for a hallway that says "Garden Terrace". Amenities: Well, aside from the fact that it's super easy to pick up some food in any of the shops below, they also offer free Wi-Fi, so you can "work from home" while getting a tan/probably not really getting a tan. Best nearby takeout lunch: Grab a pastrami sandwich from Shorty Goldstein's across the street. How to get here: Walk into the lobby, pass the security guard, and get into one of the elevators to the 15th floor. 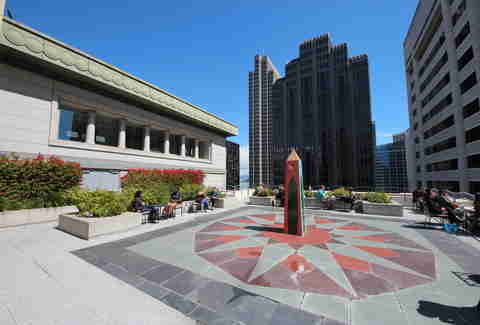 Amenities: It's got a ton of linear benches and seating areas around large planters, plus, there's an awesome view of the Transamerica Pyramid, a view of the Bay, and a sundial... for all your ancient time-telling purposes. Best nearby takeout lunch: Wayfare Tavern is around the corner, and yes, they'll actually do takeout. The fried chicken is a must, but don't sleep on the American kobe tartare served in a popover. How to get here: If you walk up from California, then it's right there. If you're coming off Pine, you'll need to walk in and look for escalators up to the terrace. 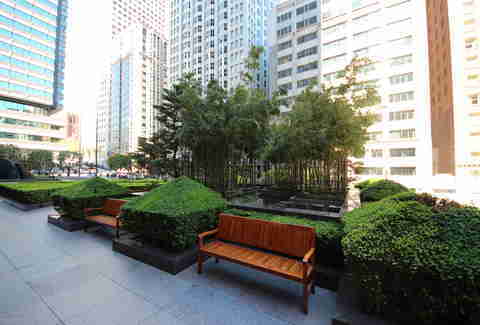 Amenities: Though not exactly a rooftop, the mezzanine does still overlook the rest of the FiDi. There are a ton of benches and a bamboo tree forest thing in the middle of it all. You can almost pretend you're not in the FiDi. Almost. Best nearby takeout lunch: Head around the corner to Harrow and grab a pork sandwich (tender belly and shoulder meat, apple-carrot slaw, shaved jalapeño, pickled onion, cilantro, and ground mustard on Della Fattoria ciabatta). How to get here: Not really visible from the street, the terraced sides of the plaza protect a large, sunken, grassy area with a huge fountain. 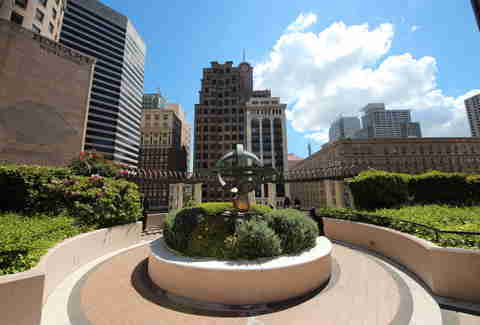 Best bet: find the plaza on 2nd St between Folsom and Harrison, and walk towards the grass steps. Amenities: The aforementioned huge fountain, abstract wooden benches, and alcoves complete with tables to eat/work off of. You could even sunbathe here without feeling too weird. Decently weird, but not too weird. Best nearby takeout lunch: Hit up Darwin Cafe a few blocks away for one of their rotating sandwiches (we suggest the Black Forest ham with salami, Provolone, peppers, red pepper spread, arugula and Dijonnaise if they have it), considering it is one of the best sandwich shops in the US. 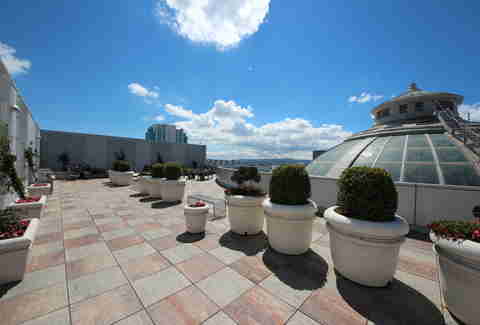 Where: 835 Market St; the Westfield Sky Terrace. How to get here: This one's the hardest to find. Don't go into the mall, but instead into the building to the left at 835 Market with an SF state flag over it. Walk in past the guard at the lobby (like you know what you're doing, so no one gets weirded out), and hop in one of the elevators to the 8th floor. Only one elevator goes to the 9th, so rather than waiting for that one, just hop off on the 8th (unless you lucked out) and hit the 'Up' button to call an elevator to the 9th floor. 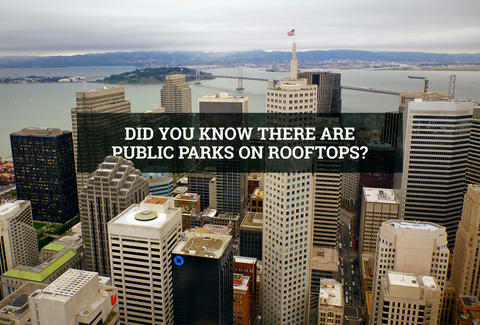 Amenities: There are a bunch of benches and a few tables, and since it's soooo high up, it gets a ton of sun. You've got views of the hills and City Hall, and you can pick up the Westfield Wi-Fi on a good day. Best nearby takeout lunch: You might want to check out our mall guide, and grab some pho from Loving Hut, because it's actually pretty great. Joe Starkey is Thrillist's San Francisco Editor and will be tanning on rooftop #5 later today. Find him on Google Earth.